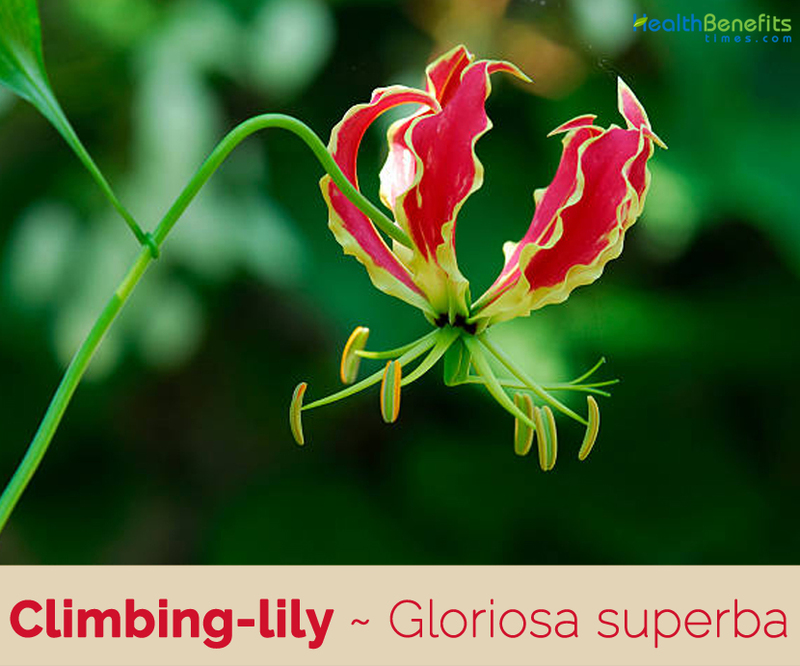 Gloriosa superba commonly known as Climbing-lily is a species of flowering plant in the family Colchicaceae. The plant is native to Africa and Asia. It is also found in USA, Indochina, Sri Lanka, and Madagascar Island. In India, it is found in Tamil Nadu and other South Indian forests. In Australia, it grows in the coastal region of Queensland. 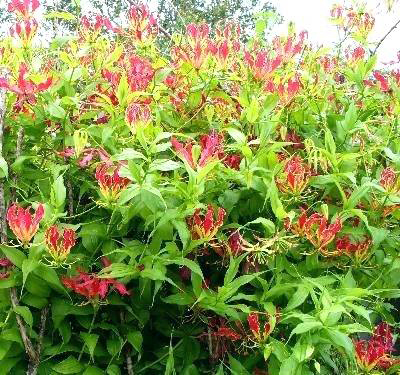 Few of the popular common names of the plant are climbing-lily, creeping-lily, flame-lily, gloriosa lily, glory lily, malabar glory lily, superb lily, fire lily, tiger claw, glory vine, malabar glory pipa de turco and vine lily. 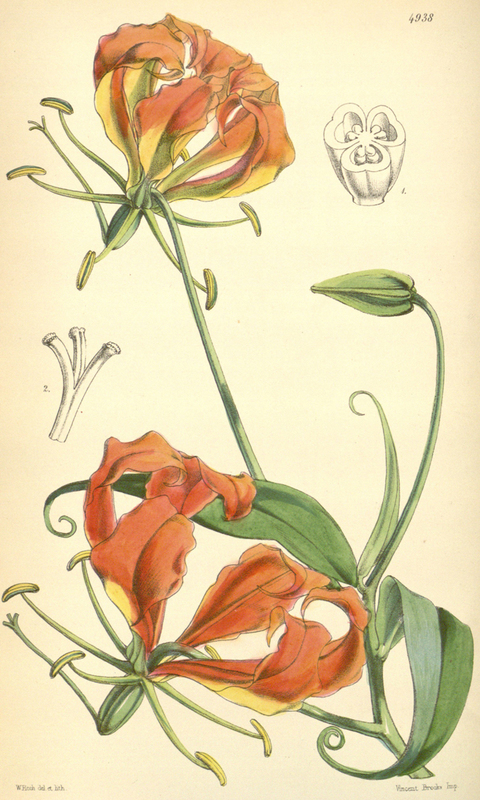 The name Gloriosa superba is composed of two words. ‘Gloriosa’ means full of glory, ‘superba’ meaning superb. And the name itself proves its medicinal value. Yet its overdose can be proved harmful. Climbing lily is an herbaceous, tall, stout climbing, perennial herb that grows about 3.5m to 6m tall. The plant is found growing in brushwood, hedges, open forest, tropical jungles, forests, thickets, woodlands, grasslands, sand dunes, mountain habitats, deciduous woodlands, sparse savannah grasslands, and shrub lands. Rootstock is a chain of fleshy arched tubers, budding from the convexity above, cylindrical, flattened, often 15 to 20 centimeters long. Cylindrical tubers are fleshy and V-shaped; and one to four stems arise from it. Nearly one to four stems grow from a tuber. Stems are stiff, bright green to yellow-green, almost succulent and glabrous. The light yellow-green very tiny buds are foliose and essentially embedded within the stem. Bark is not applicable in our region as this plant functions as an herbaceous perennial or annual; even in the tropics this vine tends to dieback and go dormant occasionally, sometimes associated with dry seasons. Leaves are evergreen or dieback in response to drought in tropical climates, but dieback due to cold in much of our region. no fall color develops in areas were the stems are nipped back by frost; alternate, or sometimes opposite or even whorled, simple, 5 to 7 cm long ovate-lanceolate to narrowly lanceolate blades terminate in extremely elongated acuminate tips which recurve to coil around objects for anchorage during climbing. The bright to rich green sessile leaves have cuneate bases, more or less parallel venation with entire to undulat margins, an extended midrib, and are glabrous with a nearly rubbery texture. The showy flower has six tepals each up to 5 to 7.6 centimeters long. They are generally bright red to orange at maturity, sometimes with yellowish bases. The margins may be quite wavy. The six stamens also are long, up to 4 centimeters, and each bears a large anther at the tip that drops large amounts of yellow pollen. The style may be more than 6 centimeters long. One flower may weigh over 2.5 grams. Flowering normally takes place from October – May. 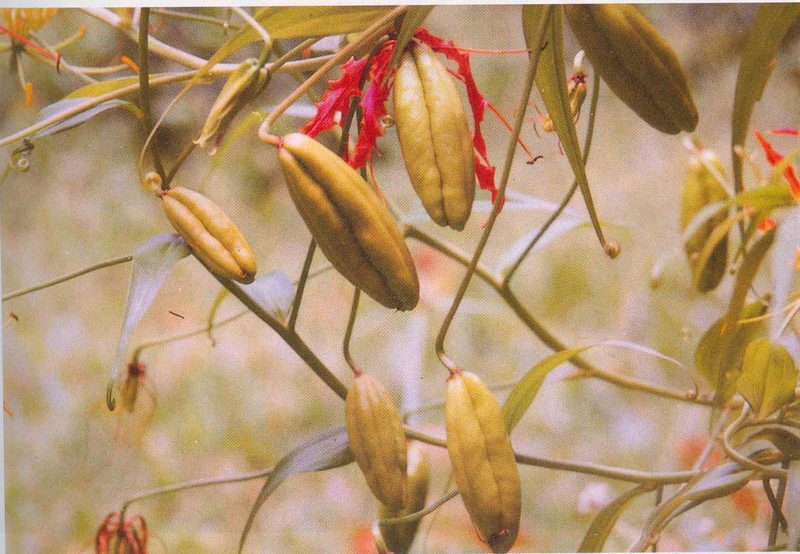 Fertile flowers are followed by ellipsoid fleshy capsule up to 6 to 12 cm long and 1 to 2 cm in diameter containing red seeds. Each valve contains 20 globose red-colored seeds. Seed is spherical, 4 to 5 mm in diameter and bright red. 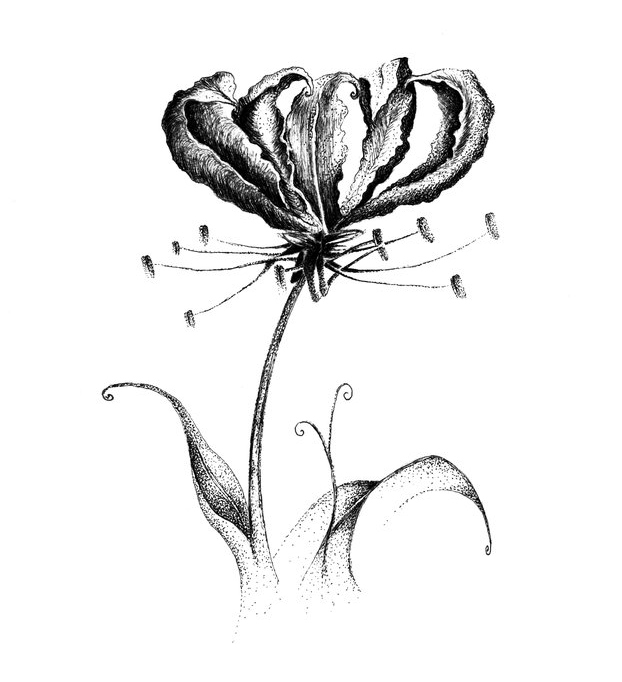 Cultivars of this popular garden plant may vary from these wild-type characteristics. The cultivar ‘Lutea’ has all-yellow tepals, ‘Citrina’ is yellow with red markings, and ‘Nana’ is a dwarf. Whitish forms are known, as well. It is used in all health conditions described above in therapeutic indications. It has antispasmodic and muscle relaxant properties. It also acts as emenagogue, so it promotes easy flow of menstrual blood and gives relief from abdominal cramps and lower abdominal pain during periods. To enhance its effectiveness, it is used with coral calcium in Ayurveda. The Dosage is used in Dysmenorrhea is 125 mg four times a day with Praval pisthi and honey. Root powder pack is applied over the affected part of the scalp. It helps eradicating fungal infections and stimulates the growth of new hairs. 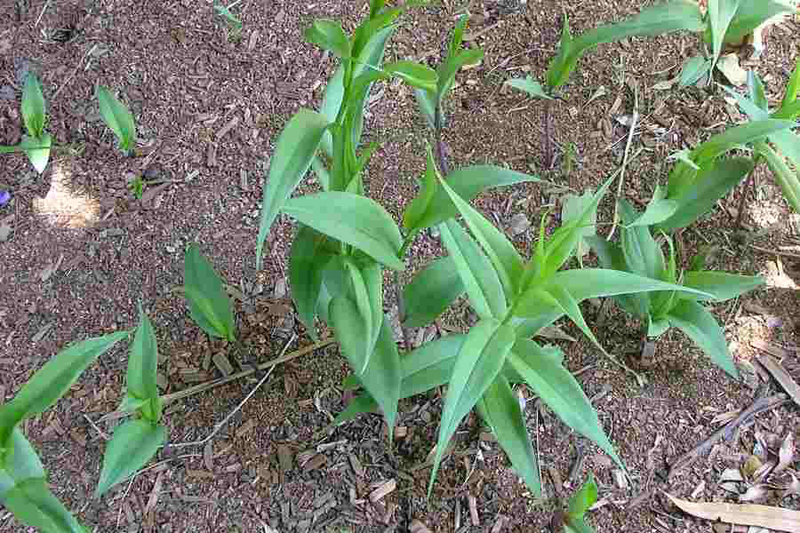 The oil obtained from Climbing-lily is useful in external abscess. The drainage of abscess before its application is required for maximum benefits. Its oil is also applied within the genital internal walls to get relief from pain of the lower parts of the female reproductive tract. 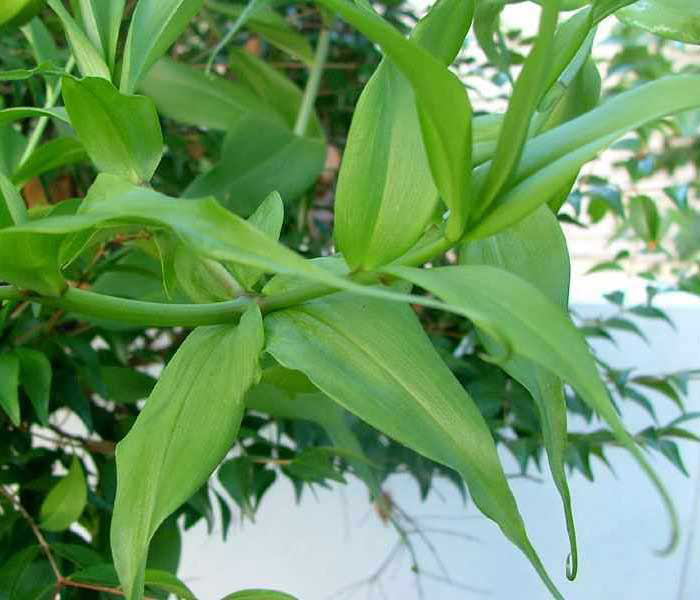 Plant has long been used in traditional medicine particularly for gout, open wounds, infertility, sprains, cancer, smallpox, sexually transmitted diseases, leprosy, kidney problems, etc. It is also used as a laxative and an alexiteric. 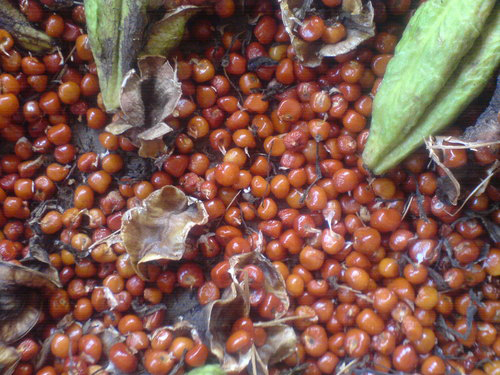 Plant is used in arrow poison in Nigeria. 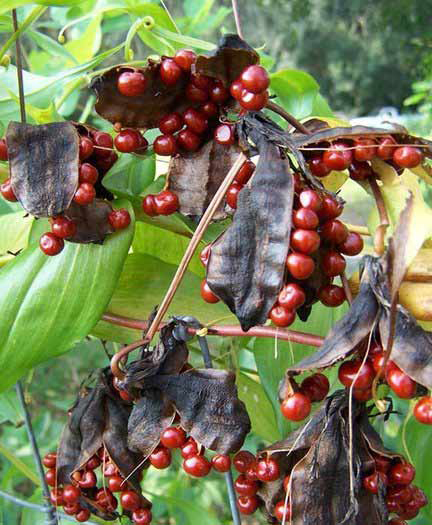 Although poisonous, the plant is often used in traditional medicine both in Asia and in Africa. Mainly used in external applications, it is also often ingested in small quantities. In Ayurvedic medicine the tuber is used as an abortifacient, alterative, anti-arthritic, anti-hemorrhoid, anti-leprotic, antiperiodic, cholagogue, purgative and tonic. It is considered to be useful in the treatment of ulcers, leprosy, piles, inflammations, abdominal pains, itching and thirst. 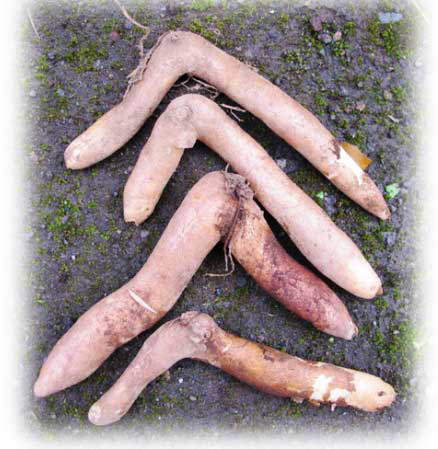 At low doses, the tuber is considered to have numerous medicinal applications in Africa. Decoction is taken to treat abdominal disorders, to induce abortions, as a tonic and as a purgative. Tuber is occasionally used as an emetic to induce vomiting as a means of removing toxins from the body. Tuber is also part of a preparation used to treat impotence and to act as an abortifacient. Sap is an ingredient of a drink that induces sleep. Applied externally, the tuber is used in the treatment of bruises, colic, chronic ulcers, hemorrhoids and cancer. It is put into poultices to relieve neuralgia, and used in topical applications to treat arthritic conditions, swellings of the joints, sprains and dislocations. It is claimed to have antidotal properties to snakebites. Macerated tuber is also taken against smallpox, leprosy, eczema, itch, and ringworm. Paste made from the tuber is applied externally to facilitate parturition. Juice of the tuber is used as ear drops to treat earache, and is also applied to the gums to treat painful teeth. Anthelmintic properties of the tuber, fruits and leaves are widely known and they are all used to treat infections of Guinea worms, schistosomes (causing bilharzia), roundworm, tapeworm, liver fluke and filaria. Leaf juice, unripe fruits mixed with butter, and tuber macerate are frequently used to kill head lice. Soup made from leaf or tuber sap is given to women suffering from sterility, delayed puberty, delayed childbirth and menstrual problems. Leaves are administered in an enema as a decongestant. Juice of the plant is drunk as an antimalarial. Used externally, a leaf decoction is applied as a liniment to ease coughs, general pain and dropsy of the scrotum. Leaf juice is instilled into the nose in the treatment of fainting. Crushed leaves are applied to the chest to treat asthma and to affected areas to treat rheumatism. Herb is burnt and the ash applied to wounds in order to promote healing. Sap from the leaf tip is applied externally to treat pimples and skin eruptions. Colchicine is used in the treatment of gout and rheumatism. At present it is the drug of choice for acute gout. It reduces the inflammatory reaction to urate crystals deposited in the joints. In parts of India, extracts of the rhizome are applied topically during childbirth to reduce labor pain. Powdered leaves are applied to wounds and sores to kill germs and promote healing. They are also ingested with Jaggery to expel roundworms and thread worms. Mixed with lime juice, the leaf powder is used as a swab for the inside of the ear or as drops for earaches and ear infections. Tuber paste is also applied to relieve bruises and inflammation. Liquid from powdered tubers soaked in water is ingested to cure gonorrhea. By applying the root powder on the scalp area, one can kill all the fungus and stimulate the growth of new hair. 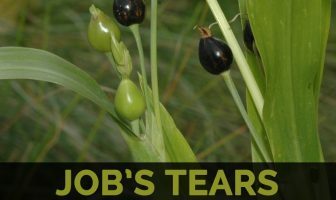 Oil of the Gloriosa superba helps treat the external abscess. Decoction and the maceration are used for the majority of internal body ailments, like abdominal pain, coughs, fever and malaria, etc. Tuber paste of G. superba is applied externally to treat venereal diseases, wounds, parasitic skin diseases and head lice. 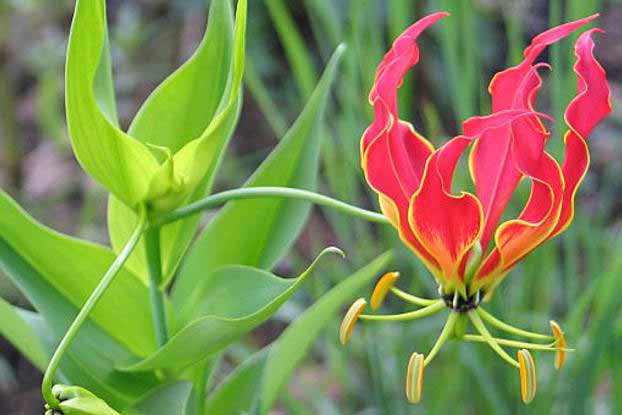 Flower of Gloriosa superba is also the national flower of Zimbabwe and state flower of Tamil Nadu. In 1947, Queen Elizabeth II received a diamond brooch in the shape of this flower for her twenty-first birthday while traveling in Rhodesia, now called Zimbabwe. 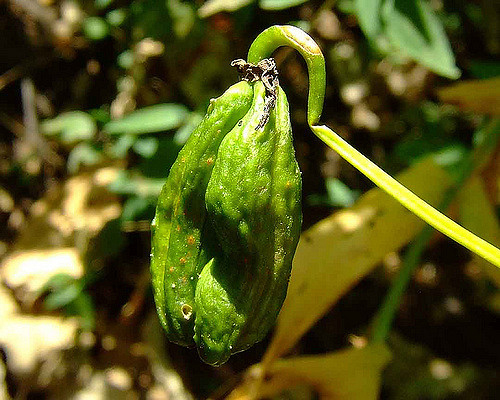 Whole plant is highly toxic due to the presence of the alkaloid colchicine. Diarrhea, nausea, vomiting and abdominal pains are often the first signs of poisoning. Diarrhea may become severe and hemorrhagic, and can thus lead to metabolic acidosis, dehydration, hypotension and shock. Burning sensation in the throat, stomach and skin may also be an early sign of intoxication. Severe reactions include extensive vascular damage and acute renal toxicity with oliguria and haematuria. Patients may develop convulsions, delirium, muscle weakness, neuropathy and ascending paralysis of the central nervous system. 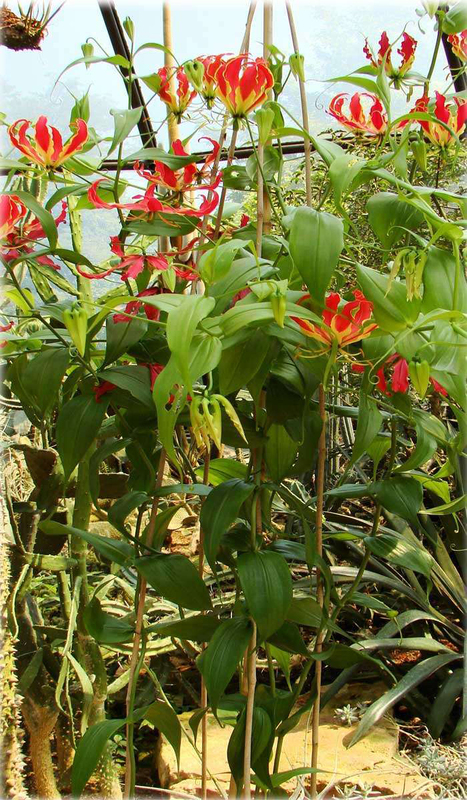 In patients who have taken an overdose of Gloriosa superba bulbs, death occurs as a result of respiratory depression and cardiovascular collapse.